This is the traditional Christmas Eve supper of many families in Northern Portugal. Rinse the cod under cold running water to remove any surface salt. Leave the fish pieces to soak for at least 24 hours in a basin with cold water. Do not cover the basin and change the water several times. 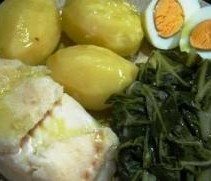 About half an hour before the meal, drain the cod portions and cook them in a pan with water and a little salt (if necessary), together with the eggs and potatoes in their skins. Meanwhile, prepare the cabbage leaves and when the cod and the potatoes are half cooked, add them and let them cook as well. Do not cover the pan with the lid so that the cabbage remains green. To make the sauce, bring the olive oil and the roughly chopped garlic to a boil in a small saucepan, remove from the heat, add a little of wine vinegar or lemon juice, beat well and serve in a sauceboat. Just before serving, peel the potatoes, shell and slice the eggs in halves. Serve hot on a big platter and season with the olive oil sauce, salt and pepper. Some people prefer to prepare their own sauce, with the ingredients mentioned above, on their individual plates.